I am back from a storytelling conference in Greece, so I finally have time to continue posting MopDog Monday. Thank you for your patience! Those who followed my blog during this year's A to Z probably got the idea that a lot of medieval Hungarian history has to do with the Turkish wars. There are still many places in the country that carry the signs of Ottoman occupation: We have mosques, Turkish era baths, minarets, and of course tales and legends. This is especially true in Southern Hungary. Recently I took a trip with my family to those parts (my mother's side of the family is from there), and visited some places that were too great not to mention. Especially because, although it was a weekend, we barely saw any tourists around. A large and very beautiful city, proud of its cultural events. The most well-known attraction is the mosque of Pasha Quasim, commonly referred to in Hungarian as the Djami. It is beautifully restored. Pécs also has one of our UNESCO World Heritage sites: The early Christian cemetery, filled with Roman era Christian mausoleums, with wall paintings, all encompassed within one brand new museum building. 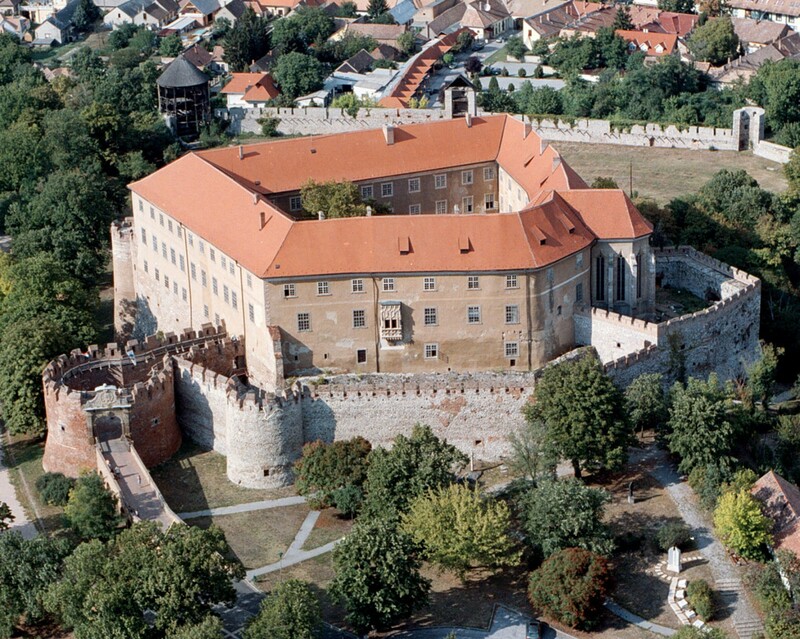 A castle that saw a lot of fighting over the centuries, and has been restored to its full glory recently. It is well worth a visit; the view from the walls is amazing, there are great exhibitions inside, a Gothic chapel, and there is even a rose garden that belonged to a famous lady in the era of the Turkish wars. At the bottom of the hill below the castle, there is another mosque, still in use by the local Bosnian community, and restored and furnished with the help of the Turkish government after spending a couple of centuries as a barn. An important site in Hungarian history: Our most famous Baroque epic is written about the siege of Sziget in 1566. It was a swamp castle during the Turkish wars. The Hungarian defenders fought to the very last, and then broke out of the inner castle in a heroic last stand, and all perished in the fight (dear Peter Jackson, please take note). Incidentally, the Turkish sultan also died during the siege in his tent; the two great military leaders, facing off to the death, never got to meet on the battlefield, but they both died on it. There is now a monument commemorating both of them, and the castle is being restored with a park, a walkway, a museum, and the mosque that the Turks built inside. It is very peaceful now, and the surrounding town is nice too. It is interesting to visit these places and reflect on history. A lot of our history and folklore has to do with the fight to the death against the Ottoman Empire; and yet, in the distance of centuries, now we get to admire Turkish culture, marvel at their architecture and art, and respect their side of the story as well. Pecs, Siklos - I would love to go. Fascinating pictures. My first thought of Peter Jackson adapting the Siege of Sziget: Who would Andy Serkis play? I am so jealous of everyone else's homelands. My hometown only has industrial toxic waste buried beneath it.